This resource guide is aimed at providing USAID practitioners involved in the planning and development of sustainable infrastructure projects with a better understanding of green infrastructure (GI) and identifying GI interventions that can be integrated into USAID projects. Recognizing the importance that GI plays in sustaining ecosystem services such water resources conservation, flood and stormwater management, groundwater recharge, water supply, and disaster resilience, the United States Agency for International Development (USAID) has identified the need for guidance in planning and design of GI solutions. 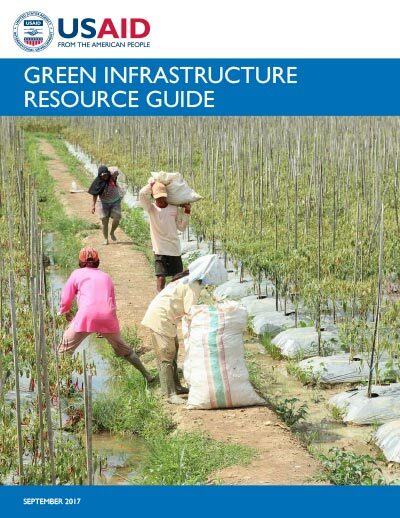 The first section of this guide, Introducing Green Infrastructure, presents the definition of GI in the context of USAID’s activities and priorities, describes how GI can be used to help communities adapt to human induced and environmental stressors, and introduces the twelve benefits that are associated with GI interventions. These benefits identified at the bottom of this page and associated icons are used throughout the resource guide to aid in comprehension. Managing soil and slope stabilization after wildfires. A general description is provided for each issue, which is followed by specific GI engineering design options that can be implemented to address the issues. Applicable benefits are discussed for each design option as well as the functional responses (i.e., how the benefits are realized) and relevant indicators to aid in monitoring the performance of a GI solution. Important elements for integrating community needs and local conditions into site-specific GI design are also presented, and examples are provided to illustrate how GI should be planned in coordination with community stakeholders and tailored to site-specific conditions. An education and awareness section is also provided that identifies what specific type of knowledge or information an implementer of a USAID project should consider providing to stakeholders to enable them to construct or manage and operate a successful GI system, which is followed by suggested design, evaluation, and monitoring resources. The resource guide concludes with a discussion of how GI can be applied to various settings and scales, including urban, rural, and watershed landscapes, which require an understanding of the range of available opportunities and constraints. A discussion is also provided on how GI can build resiliency into the environment by reducing flooding impacts and leading to less emergency response situations.